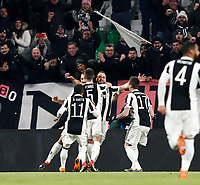 Calcio, Uefa Champions League, andata ottavi di finale: la Juventus ed il Tottenham Hotspurs pareggiano 2-2 all'Allianz Stadium di Torino,13 febbraio, 2018. Doppietta di Gonzalo Higuain per la Juventus e goal di Harry Kane per il Tottenham nel corso del primo tempo. Pareggio del Tottenham con goal di Christian Eriksen nella ripresa. Football, Uefa Champions League, Round of 16 1st leg : Juventus drawns 0-0 with Tottenahm Hotspurs FC at the Allianz Stadium in Turin, February 13, 2018. Juvemtus' Gonzalo Higuain scores twice and goal by Harry Kane for Totteham in the first half time. Goals by Tottenham's Christian Eriksen in the second half.